Good morning! I pray all is well in your neck of the woods. There is a summer bug going around that hit me over the weekend, but I’m still moving on in Christ. Have a wonderful day and I pray today’s poem blesses you. If you never get up and try! ~What are you willing to do to become great? One thing that is constant is change. The world is constantly changing and as you grow spiritually you will change. There are times when God will stretch you beyond your comfort level and it’s not to harm you, but to increase your faith and trust in Him. Are you willing to go through a stretching and a pressing for a “season”? Some people hinder the growth process because they refuse to change. You have been stuck in a situation for a long time and you want to get out, but you refuse to go through the shaking, the pressing, and the beating because you are comfortable. When will you become so uncomfortable in your current situation that you will embrace the change that is necessary for you to improve in life? The discomfort of changing will only last a season, but your misery will last a lifetime if you refuse to take the first step and CHANGE! Good morning! Happy Friday. I pray that your week has been a great one! I decree and declare that peace will follow you all the days of your life. In the name of Jesus everything the enemy has plotted against you will fail. I decree in the atmosphere that God’s grace will cover you and His favor will chase you all the days of your life. I declare in the spiritual realm that NO WEAPON FORMED AGAINST YOU SHALL PROSPER. With the power and authority of Jesus Christ who lives in me, I speak life into your situation. Every person who rises against you God will take care of. Every person who seeks to destroy you will become the very person who blesses you. I decree and declare that heaven will open up and pour out blessings that will fall onto you, your children and your children’s children. I decree and declare that your health will be restored, your joy will be restored, your wealth will be restored, your love will be restored in the name of Jesus. I speak great things into your life because GREATER IS COMING!!! Now walk in your purpose. Rise up and take your place in the royal priesthood. Speak with authority. Bind the enemy. Praise God for being God. This is my declaration to you! In Jesus name, the name that is ABOVE EVERY name, Jesus Christ I pray, AMEN!!! Good morning! Happy Tuesday to you all! I pray that each and every father had a blessed and Happy Father’s Day this past weekend. Fathers you have a great responsibility to lead by example. Your children are always watching you, even when you think they aren’t, they are. Take your role seriously and pour into your sons and daughters. I send blessings to all of the GOOD fathers! 9 How long will you lie there, you sluggard? When will you get up from your sleep? 10 A little sleep, a little slumber, a little folding of the hands to rest— 11 and poverty will come on you like a thief and scarcity like an armed man. I started a different blog yesterday and then God silenced the thought. Sometimes God will delay a message in order to speak to the messenger. I pray this word blesses someone because it blessed me. While getting ready for work this morning, a sweet voice whispered “Comfort can be crippling.” I let out an audible “OUCH LORD!” Immediately the words penetrated my soul and I began thinking of examples in my life where I allowed comfort to keep me crippled. The word cripple means to disable, damage or impair the functioning of. When you become too comfortable in a certain situation you can disable, damage, or impair the functioning of your calling! WOW!!! On the surface, one may say, “Well I do want to have a comfortable life.” But I would step out to say, what price are you willing to pay for your comfort? We can become so comfortable in a toxic relationship that we disable our self-esteem and love towards others. We can become so comfortable in ministry that we damage our potential to seek a deeper relationship with Christ. We can become so comfortable in our careers that we impair the functioning of our untapped potential. Sometimes being comfortable can be crippling! How many times have you settled because you were comfortable? Some people use comfort to keep them bound and in fear. You are so comfortable that you are terrified at changing. You dread stepping outside of the box because you like doing the minimum. You like doing just enough to get by. But when you do this you are crippling yourself. You are limiting yourself. You are depriving yourself. It’s time to step outside of your comfort zone. God wants more of you and He can’t get you to the next level if you refuse to step out of your comfort zone. Being too comfortable can make you lazy and scripture tells us that the “sluggard craves and gets nothing…” There will be times when you will desire so much in life, but if you don’t put in the necessary work you will get nothing and live a frustrating empty life. Comfort can be crippling! Are you ready to get uncomfortable for a season in order to experience the fullness of God? He has more in store for you! Get busy! Happy Friday to you all! I pray your week has went well. Remember when you can’t see God’s hand in your life, trust His grace is covering you. 15 My prayer is not that you take them out of the world but that you protect them from the evil one. 16 They are not of the world, even as I am not of it. 17 Sanctify them by[a] the truth; your word is truth. 18 As you sent me into the world, I have sent them into the world. The umbilical cord is a natural channel which carries fluids between the developing embryo or fetus and the placenta. The umbilical cord is necessary for the developing life of a child and stays in place until after birth. Today’s message is very simple-BELIEVERS CUT THE UMBILICAL CORD TO THE WORLD!!! Before we accept Christ, our focus is on seeking the approval and critique of the world. We need the world to validate us, we need the world to co-sign our behavior, we need the world to tell us what’s “In and Out”. We are essentially attached to the world by an umbilical cord. We look to the world to bring us all that we need to sustain life. Now once we accept Christ as our personal savior, we need to cut the cord! 2 Corinthians 5:17 (NKJV) says, “Therefore, if anyone is in Christ, he is a new creation; old things have passed away; behold, all things have become new.” It’s time to cut off the old things that were attached to our identity when we were in sin and walk in our new self-image in Christ. Romans 12:2 tells us not to be conformed to the world. There are too many believers trying to make the world fit in their Christian life, when we really need to make our Christian life dictate how we conduct ourselves in the world. John 17:15-18 tells us that we are not of this world, so why do so many believers try to make this world their home? Why are so many believers trying to fit into the world? Romans 8:9 tells us that we are spiritual beings! This means that we are spiritual beings living in the world, much like Christ, a spiritual being, who was made flesh. Christ was in the world, but not OF the world! We are in the world, but not OF the world! So we must stop conducting ourselves as fleshly beings trying to do spiritual things and begin walking in our calling. We are spiritual beings who happen to be wrapped in flesh. Since we are spiritual beings, it’s time to cut the umbilical cord to the world. We don’t need the world to supply us with what we should think, how we should act, what we should say, who we should hang around, how we should care for ourselves and our loved ones and the list goes on. We need to walk in our calling of the Most High. Believers-if you are wondering why you can never get ahead in life, it’s probably because you are still attached to the world. CUT THE CORD!!! God wants you to walk in your purpose. Are you ready to cut the umbilical cord to the world? Good morning! Happy Wednesday to you all! I pray your week is going well. I pray God’s safety and protection for all of the children who have graduated or who will be graduating from high school and college. I also pray for the children as they enter on summer break. May the Lord continue to keep them in His perfect peace. Get your children involved in a lot of things over the summer so they don’t become idle. An idle mind is the devils play ground. Let’s keep our kids covered this summer. Much like the common cold, attitudes are contagious. In order to become sick, you have to come in contact with the person with the cold like symptoms in order to be exposed to the sickness. People can catch the common cold by air-borne germs or even physical contact to the person. A person can become sick, just from being in the same proximity of a person who is currently sick. This is also true with attitudes. One can take on the attitude and characteristics of a person just by being in contact with them for a consistent amount of time. There are even times when you can take on the attitude of someone with one interaction. Have you ever walked into your office in a good mood and someone comes in complaining and moping and without even noticing you get sucked in and begin complaining and moping? What happened? There was a transfer of attitudes. You have “caught” someone’s attitude. As believers, we should conduct ourselves like Christ. We should take on the mindset and attitude of Christ and spread His light instead of taking on the darkness of others. We should treat others the way Christ treats us. 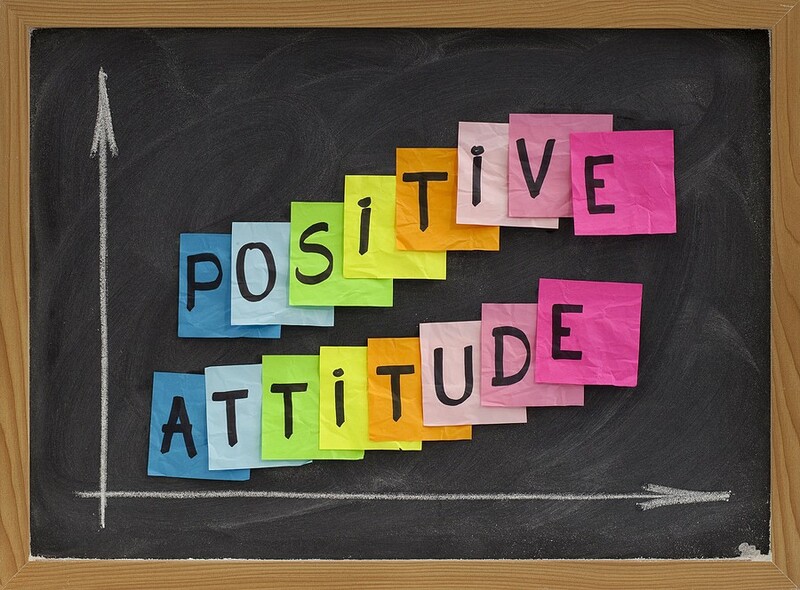 Imagine what would happen if everyone had a positive and loving attitude towards life? I don’t know about you, but negative people are draining and depressing. My day would go a lot smoother if I didn’t have to entertain the negative rantings of some people. Even the bible tells us to do everything without grumbling and arguing. So if you don’t want to listen to me, listen to the Word of God and stop complaining. It’s time to stop being negative. If someone caught your attitude would it make them better or worst? These are questions that you should ask yourself daily. When I walk into a room I want people to catch on fire with love, joy, peace, happiness, laughter, encouragement, and support. We should desire to spread the light and love of Christ because people need it. Be careful about what you say and how you say it. Be careful about what you post on Facebook and Twitter. Be careful because everything you put into the atmosphere is a symptom that someone can catch your attitude. Do you want the world saturated with people whose attitudes are like yours? Have a blessed day and remember that Christ is the greatest example of humility and love. Let’s catch His attitude! Good afternoon! Happy Friday to you all! I pray that God continues to keep you all safe. Raise your hand if you talk to yourself? If you are honest then your hand should be raised. I had to stop typing in order to raise my own hand (giggling). Now some of us may have audible conversations with ourselves, where I would venture out to say that majority of us have subconscious conversations with our selves. The subconscious is the unconscious part of the mind where mental activity is not directly perceived by the consciousness. This is the area from which memories, feelings, or thoughts can influence behavior without realizing it. This is the conversation that could take place while an audible conversation is actually taking place. For example, you could be having a conversation with a person who you disagree with and in your subconscious you are telling this person off, while in reality you aren’t doing this. But if you listen to your subconscious long enough you could end up doing something out of character. That’s why it’s important to check your self talk! The bible tells us that as a man thinks in his heart, so is he. If you think you are a loser then you will conduct yourself as a loser. If you think you will never succeed then you will never succeed. If you think you are a failure then you will consistently fail all because of your negative self talk. Check your self talk. What have you said about yourself today? Have you thought you were fat, dumb, loud, angry, insignificant, or did you think you were brilliant, beautiful, handsome, or exciting? If your self talk is negative then you will begin manifesting the characteristics of a negative person. You will probably be your biggest critic and it’s important to start becoming your biggest fan. It doesn’t mean to become arrogant or conceited, but it is important to lift yourself up. The world will do a great job of tearing you down and it’s important that you can speak a word of encouragement over your mind, body and soul. It’s a new season and a new day and it’s important to speak life into who you desire to become. Take time out of each day and check your self talk. Remember your thoughts become actions and your actions will affect who you will ultimately become. Have a blessed day you wonderful people! Thank you for your continued support of this blog! God bless! Good afternoon! Happy “Positivity Challenge Month! I hope your day is going well. Remember to take one day at a time and spend more energy putting positive thoughts, words and actions into the atmosphere instead of negativity. Surround yourself with people who will speak life into your life. The world does a pretty good job of teaching us how to belittle one another, tear each other down, gossip, bully, and the list goes on. As believers, we shouldn’t operate as the world does. We shouldn’t walk around quoting John 13:34-35 (NIV), 34 “A new command I give you: Love one another. As I have loved you, so you must love one another. 35 By this everyone will know that you are my disciples, if you love one another.” then turn around and curse our brother and sisters. We have to stop tearing one another down and start encouraging one another. Every day people are faced with ridicule or negativity either at school, work, home, or in their community and the last place they should have to face it is in the church. The Word of God tells us to encourage one another and build each other up. Since this is Scripture, why are there so many Christians tearing other people down, why are people being mistreated or even shunned because they are different and why are people experiencing a level of hurt that they have never felt before in the church? I would venture out to say that it’s hard to encourage others when you are not filling your spirit with the things of God. It’s great to quote scriptures, but there’s more power when you can live the scriptures. When God commanded us to love one another he knew that we couldn’t do it on our own. God knew we needed an example to follow so He sent us Christ. We have to love like Christ loves us because we are incapable of loving like that without His Spirit within us. The more you hang around Christ the more it will show in your life. It’s time to stop tearing down one another and start encouraging one another. Someone may come into your presence today and they may be ready to give up on life and how you treat them can be the deciding factor on what they do. Choose to encourage everyone you see. It’s time to share the love of Christ through encouragement. Good afternoon. Happy Monday to you all. I pray your weekend was a blessed one. A few of my friends decided that we would enter into a “positivity” challenge for the month of June. This is a time where we think, speak, and act positively. I know this may seem like an impossible feat for some, but it’s something that will definitely help us to grow. For the most part I would consider myself to be a positive and happy person, but then there are times when I give way to complaining and murmuring. I began to notice that these types of attitudes and behaviors stifle productivity. This scripture tells us that we have the power to bring life or death to a situation with our words. That’s deep! Have you ever complained about a “dead” situation so much that you ended up bringing it back to life? Let me clarify, have you talked about something from your past; like a failure, a bad relationship, a tough experience, etc., so much that it felt like it was happening today? I know I have and I’ve even caught myself doing that in the present day. It’s time to let dead things stay dead. Stop resurrecting things that should be buried. It’s time to saturate the atmosphere with positive energy and to give up on meaningless destructive speech. As believers, the same power that raised Jesus from the dead dwells in us and we need to stop using that power to raise up dead issues. Stop bringing up the issues of your past, stop trying to resurrect dead relationships, stop trying to speak life into your past behaviors and attitudes. We need to use the power that dwells in us to encourage the discouraged, to uplift the people with heavy hearts, to bind negativity and to speak positive things into the atmosphere. Stop misusing the power that dwells within you. Let dead things stay dead. This scripture let’s us know that death no longer has dominion over Christ and since the same power dwells in us, death doesn’t have dominion over us. So stop allowing dead things to have dominion over you. When you allow negative thoughts to rule your mind, your speech, and your actions, you are allowing dead things to control you. Negativity breeds negativity and in turn it causes death. It causes death to your hopes and dreams. It causes death to your productivity. It causes death to your way of living and the people around you. Let dead things stay dead. Join me in this challenge to become a more positive person. When negative things, people or thoughts come your way, turn them over to God. Don’t give life to these things or these people. This challenge will not be easy, but it will be so rewarding if you seriously give it a try! Let dead things stay dead!